Yes, I'm A Christian AND…? By now you’ve probably heard of this viral video from Buzzfeed. There are many, many awful things about this video, but honestly what I dislike the most about this video is just how bland the Christianity is. So yeah, you’re Christian and you like Beyonce and you’re not judgmental and you’re queer, blah blah blah. WARNING: MAJOR CATHOLIC BRAGGING AHEAD. One wonderful thing about being Catholic is that there’s this beautiful phrase called “both/and.” As in we are Catholic AND we’re human beings like everyone else on this planet. I found this wonderful infograph on a Catholic tumblog that pretty much explains how Catholics see the world. So Catholics are Christian but…unlike Protestant denominations, we believe that salvation is gained through both faith and works, which means accepting God’s gift of grace and cooperating with Him. Grace is the spirit that inspires us to go out into the world and helping the poor and needy. We believe that we can receive forgiveness from our sins both directly from God in prayer and through the Sacrament of Confession. We are people that are good because we are created in God’s image and sinful because we’ll always be in need for forgiveness. What are we? We are a people who are free to make our own choices and obliged to choose what is good and right. We understand the world through religion and science. We can explain that the world was both divinely created and had natural evolution. We are a church made of traditionalists like Peter who remind us of what our core values are and visionaries like Paul who want to help make the church better. What do we want the world to know about the Catholic faith? That the greatest commandment is to love God and to love all. We love our neighbors, our enemies, and ourselves. That our religion is based on Scripture and tradition. That we take the Bible as literature and interpret it spiritually for theology and ethics. We mediate on God’s word because it’s prayer and also study it because it’s history as well as theology. 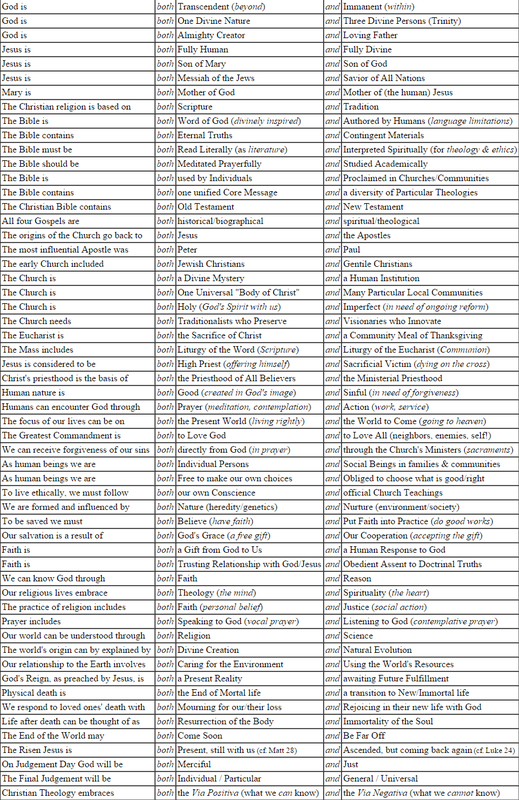 That we believe in a God who is a father and a king and his Son and the Holy Spirit and…I might as well just copy and paste the Nicene Creed at this point. Finally, who do we say that Jesus is?